Our Cellar Door is at 340 High Street, Nagambie in the historic old general store. From time to time we have special Cellar Door Days on which we are open for wine tastings and sales. Watch this space for more details. 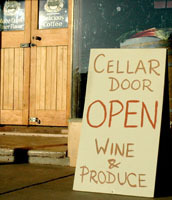 Join our mailing list to receive advance notice of cellar door days. Otherwise, we are open by appointment only. For more info call us on 0439 963446.